Burgers are the archetypal fast food, and they are loaded with fat and salt when bought from a burger van or fast food restaurant. Burgers in themselves don’t have to be the unhealthy option though – there are ways of making this junk food treat a delicious, healthy meal. Here are a few recipes that can be adapted to your own tastes. The classic beef burger can be made into a lower fat version with ease. Burgers are easy to make, and the burgers you make at home from scratch are bound to please kids and adults alike. Mix together the steak, onion (you can brown the onion before mixing in if you prefer) herbs and seasoning in a large bowl, until well combined. Divide the mixture into four patties about half an inch thick, and put in the fridge to chill for around 20 minutes. After the mixture has chilled, cook the burgers under a pre-heated grill for about five minutes on each side. Turkey is one of the lowest fat meats that you can buy, and it’s also one of the ‘super foods’ due to its high levels of B vitamins, and selenium. It’s an all round good choice for any meal and can be made into delicious turkey burgers with just a few ingredients. Mix the ingredients well in a large bowl until they are well combined. Separate the mixture into four burger shaped patties and chill for about 20 minutes. 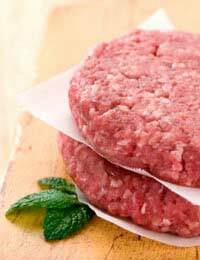 When chilled, take them out and cook under a preheated grill for about 20 minutes, turning once.When the juices run clear the burgers are cooked, and you can serve them in a bun or a roll with salad and ketchup. Spice the burgers up with extra herbs, paprika, Worcester sauce or even chilli powder if you fancy a change. Pork and apple are a delicious combination, and one you don’t tend to see much on a burger bar menu. This is one of those recipes that will become a favourite as it’s just so easy. The burgers can be made in no time at all, and served up to appreciative family and friends either at a barbecue or just whenever you feel like it! Mix all of the ingredients together in a large bowl until they are well combined, and then place under a pre heated grill for ten minutes. Serve with apple sauce on toasted buns, with a side serving of salad for good measure. Cracking recipes, have never considered turkey although have eaten shop bought ones but remember them being rather greasy with not much actual turkey, this recipe sounds delicious.